Review: Everything you have heard about this book is true. There is gripping romance, interesting characters, a fabulously dystopian society, and an UNBELIEVEABLE ending. Ah! Why only 4.5 stars, then? Well... it just didn't Match up to a certain book I read that was very similar. *cough* But I try not to compare book-to-book. It's usually not fair, and I know that most people won't agree with me. WHY would people eliminate love? Now, you're listening to worlds biggest love-skeptic. I haven't found it yet, and I am not actively pursuing it at this moment. So when characters in novels fall so head-over-heels that they can't think straight or do anything else I usually roll my eyes and groan.Especially teen love. Seriously, people? Seriously? HOWEVER, even I can't understand why a society would want to eliminate love entirely. I mean, sure, it causes you to think irrationally, and it can cause heartache, but it does so many good things! This book talked about some mothers who were so unattatched to their children that they KILLED them. Because they just didn't care. So this just made me read the book with one eyebrow raised. Like, really? Everyone in this book seemed so... sad. Perhaps you are SUPPOSED to think this. Most dystopians challenge you to find the errors in their society, and usually they're easy to spot, but it's also easy to spot WHY someone might have thought it was a good idea. I just couldn't figure that out for Delirium. Hm... I guess The Giver sort of did this "getting rid of love" thing. But not qutie to this extreme. I know that I'm one of the very few reviewers who didn't give this a glowing, 5+ stars review. 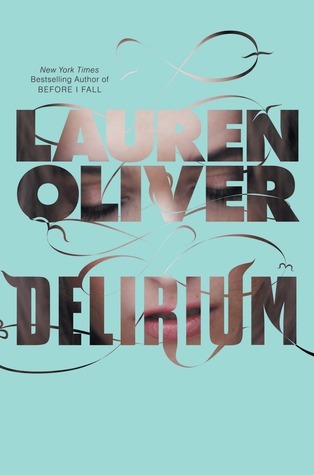 And I didn't take this stance because I wanted to stand out, because Delirium is EXTREMELY good. SO good. Once I sat down to read it I couldn't move! So despite the fact that I had some issues with the story and characters, they weren't major. I highly recommend y'all read this book when it comes out. I can't wait to read this! It sounds really good. And yeah it seems like a lot of books right now are trying to fill The Hunger Games niche by writing Dystopian trilogies with love triangles. While I love these kinds of books I hope that they don't just turn into some sort of commodity like vampire books. I want quality not quantity! Katie, NOOO!!! You must read MATCHED! I can't wait for Delirium... it sounds so so good!! A world with no love... it seems so difficult to conceive! Can't wait for this one and Matched, as well! I haven't read Matched yet, but I do want to. Like Melissa, I did find similarities between Delirium and Uglies, but Delirium was so much better. The ending was perfect for me, and it was terrible at the same time, cause I didn't know it was the first book in a trilogy, I thought that was it! Enna-I totally agree with you on the "why get rid of love" question. I was thinking the exact same thing while I was reading it. I kind of inferred that life got really bad with a lot of hate and this was their solution. Or something. But it still didn't make much sense to me. Katie-I think you should read Matched, too. It's wonderful! Once I got through the first few chapters of Delirium the similarity between the two stopped. At least for me. Just finished this book - wow, I couldn't put it down! The author didn't really go into a lot of details about the government leaders. I can totally picture a president/dictator similar to the one in The Hunger Games where there are horrible laws in place that only apply to the general population, not the leadership. All the quotes she puts at the beginning of the chapters sound like government propaganda made to scare the people into submission. What better way to make the people passive and obedient than to take away their ability to feel passionate about anything? I don't know if the author will go the route of The Hunger Games trilogy (uprising, etc.) but it seems possible since she talks a lot about "the resistance." It just seemed more like an oppressive government situation rather than the people as a whole decided to abolish love. Im so excited to read this book and i agree why get rid of love it does so much good in the world and I head matched is like a lot of books whoops but I'm still excited to read it gosh thinking next week I'm going to have Delirium, insert JIG!! !yay thanks for the review!!! !